Big Kat honors and a check for $1,000 went to Burt Hunt with a 49.24 pounder. Anglers from across the region travelled to Gallipolis in order to compete for top honors in the Cabelas King Kats Tournament on the Ohio and Kanawha Rivers Saturday. 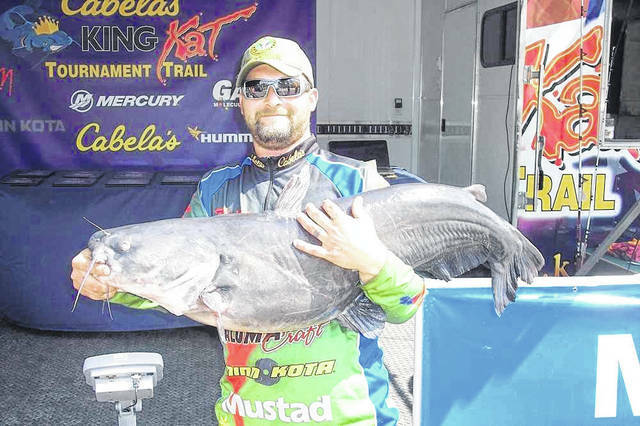 GALLIPOLIS — 50 teams of Catfish anglers from seven states traveled to Gallipolis to fish the Ohio and Kanawha Rivers for a Cabela’s King Kat Tournament Trail event this past weekend. Pre-fishing produced some good fish and anglers approached the event on April 12, 2018 with optimism. Competitors were vying for $12,250 in cash and prizes, and an opportunity to qualify for the $110,000 Classic Championship to be held September 14 and 15, 2018, on the Ohio River at Jeffersonville, Ind. The weather was sunny in the 85-90 degree range. Wind was blowing at 10-15 mph from the southwest. The river had been on the rise with lots of current during the week but calmed down before tournament day. A good bite, close weights, and a lot of big fish characterized the tournament at Gallipolis. Twelve hundredths of a pound separated first and second place and just 3.42 pounds separated the second and third place teams. 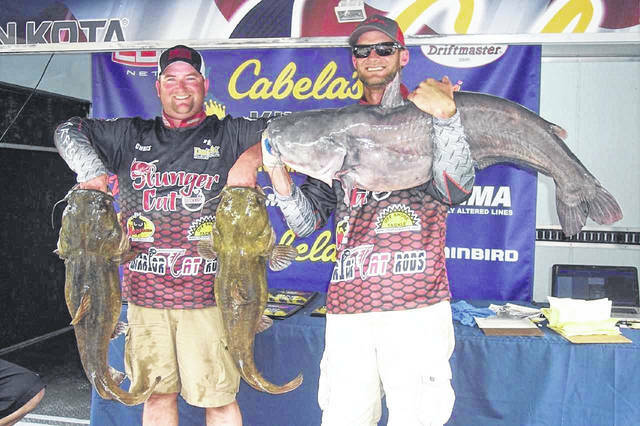 Chris Souders and Nick Conaway teamed up at Gallipolis to claim top honors on the Ohio River. They took the weekend crown by weighing in 106.60 pounds, just .12 pounds ahead of the second-place team. Their bag included second Big Kat of the day at 48.70 pounds. Souders, from Oak Hill and Conaway from Lucasville fished on the rope, up the Kanawha River almost to the tournament boundary at the Buffalo River Bridge to earn $4,500.00 for the day. There was no culling of fish for them. They caught only five cats during the day, a mixed bag of blues and flatties. “We just had five bites and caught five fish,” reported Souders. “We used cut shad, skipjack and mooneye as bait. Our fish came from heavy structure in about 15-25 feet of water. Souders credited the quality of fish this weekend to West Virginia’s efforts towards taking care of and protecting the trophy catfish. Willie Smith and Nick Anderson from Frankfort, combined their catfishing skills to bring 106.48 pounds to the scales and earn $2,300.00 for second place. The competition was tight with only a fraction of a pound separating the first two spots. Smith and Anderson fished north of Gallipolis by the power plant. They anchored, targeting fish in structure and landing 20 fish for the day. They used bluegill and shad for bait. They indicated that the wind made anchoring tough so they threw a driftsock out the back to stabilize the boat. Third place went to the team of Chris Rhodes from Scott Depot and Chris Hatfield from Hurricane. They brought a bag of 103.06 pounds to the scales and earned $1,600.00 for their efforts. Rhodes and Hatfield anchored up in the Ravenswood area of the Ohio River to catch 6 fish on the day. They targeted fish that were holding tight to structure in 12-15 feet of water. They stated that it was pretty tough fishing, probably because the river was just starting to straightening out after being on the rise. They used shad and skiphack to catch their third-place bag. Anthony Murphy and Michael Snyder took fourth place with 79.1 pounds. The Millersburg team fished 2-3 miles downriver from Gallipolis. Murphy and Snyder were targeting ledges in 25-30 feet of water. They anchored up and used shad for bait. They bagged their fourth-place weight from about 15 fish that they caught during the day to earn $1,000.00 for their efforts. David Hart and Teresa Shelpman from Otway only caught 5 fish on the day, but it was good enough to earn $650.00 and fifth place in the tourney. Their five fish weighed 78.62 pounds. David and Teresa fished in the Ravenswood area of the Ohio River. They were targeting structure 15-20 feet of water. They fished on the rope using shad for bait. The Remaining Top Teams: 6th Place, Adam Scott & Cody Williams (Buffalo, W.Va. and Redhouse, W.Va.)-71.78. 7th Place, Joe Granata & Graham Maxwell (Monaca, Pa. and Rochester, Pa)-61.18. 8th Place, And Big Kat (49.24) – Burt Hunt (Concord, N.C.)-60.92. Tournament director, Jeremy Coe thanked Amanda Crouse and her staff at the Gallia County Convention and Visitors Bureau for making this event possible. For more information on the championship and other King Kat activities visit their website at www.kingkatusa.com. Anglers can also follow the trail on the Cabela’s King Kat Facebook Page.